Cook the recipes that Shalane Flanagan ate while training for her 2017 TCS New York City Marathon historic win! Shalane Flanagan is the co-author of the New York Times bestseller Run Fast. Eat Slow. She is an Olympic silver medalist, 4-time Olympian, winner of the 2017 TCS New York City marathon, and multiple American record holder. She finished second in the 2010 NYC marathon and ran the fastest time ever by an American woman at the 2014 Boston Marathon. She has been running at an elite level for 14 years and typically runs 100-plus miles a week. She lives in Portland, OR. 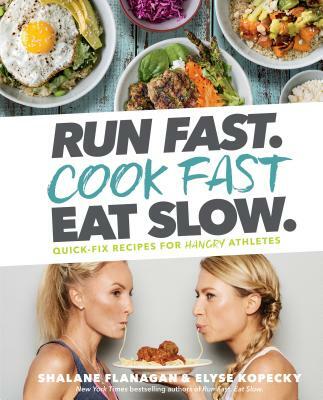 Elyse Kopecky is a chef, speaker, nutrition coach, and New York Times bestselling co-author of Run Fast. Eat Slow. The book features Elyse's "indulgent nourishment" food philosophy for long-term health and happiness. She studied nutrition at the Natural Gourmet Institute, the nation’s top health-supportive culinary school. She lives in Bend, OR.